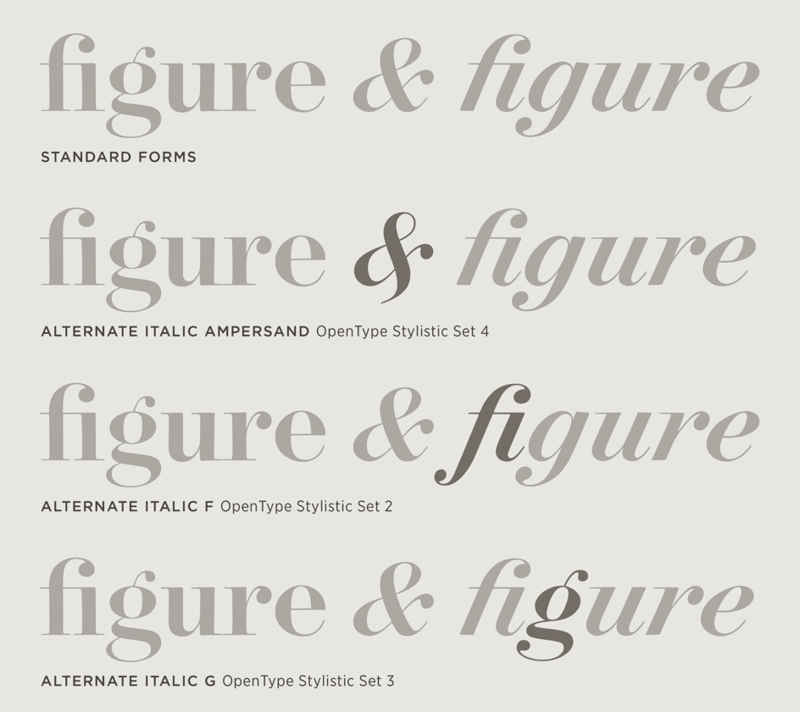 Surveyor Font Features: Stylistic Sets | Hoefler & Co. In sophisticated applications such as InDesign, it’s easier than ever to use Surveyor’s wealth of alternate characters. Traditionally, designers have had to hunt for a font’s alternates in a vast palette of glyphs, from which individual characters could be inserted one at a time. Surveyor takes advantage of Stylistic Sets, a powerful OpenType feature that allows related groups of characters to be introduced throughout the text, making it easy to alter the mood of the typography with a single click. Ampersands with descending tails were popular in commercial engraving, appearing on stock certificates and banknotes throughout the nineteenth century. All of Surveyor’s italics feature this construction as an alternate, invoked by activating Stylistic Set 4. Surveyor’s italics feature a non-descending f, characteristic of the “stump style” lettering used by mapmakers. A more traditional typographic construction is available in Stylistic Set 2, which adds a descender to the f, the fifteen f-ligatures, and the German eszett (ß). Commercial engravers popularized an alternate form of the lowercase g with an open loop and an antenna-like ear. We’ve included this pyrotechnic form in all of Surveyor’s italics, available as Stylistic Set 3. Surveyor Text contains two mechanisms for building fractions, featuring both diagonal and horizontal fraction bars. (In the composing room, these were affectionately known as “mutton” and “nut” fractions, from their relationship to the proportions of the fonts’ em-space and en-space.) Surveyor’s OpenType fraction feature converts numbers separated by slashes into fractions, and Stylistic Set 6 rearranges these fractions about a horizontal bar. Stacked fractions support single or double digits on either side of the fraction bar; diagonal fractions can be of any length. Surveyor’s swashes are automated to help manage character collisions and erratic spacing. These rules can be overriden by Stylistic Set 8, which enables all swashes, regardless of their context. This technique is especially useful when letterspacing swash capitals, where tracking offers a natural buffer between letters. Standard punctuation marks are designed to accommodate the position and scale of the lowercase. When using the all caps OpenType setting, Surveyor substitutes alternate versions of the hyphen, en dash, em dash, parentheses, brackets, braces, and guillemets, which are raised to align with its capitals. Stylistic Set 7 also activates these characters, along with a raised colon that’s useful when indicating the time. The standard symbol for a registered trademark is superscripted, to align with the symbols for trademark and servicemark. Surveyor includes an alternate form that matches the height of the copyright and publishing symbols, available through Stylistic Set 1.